Naga Blog | Benefits of training martial arts over fifty. Yes, YOU! The Human Snowball – or – Does Martial Arts Training Help an Old Lady Ski? 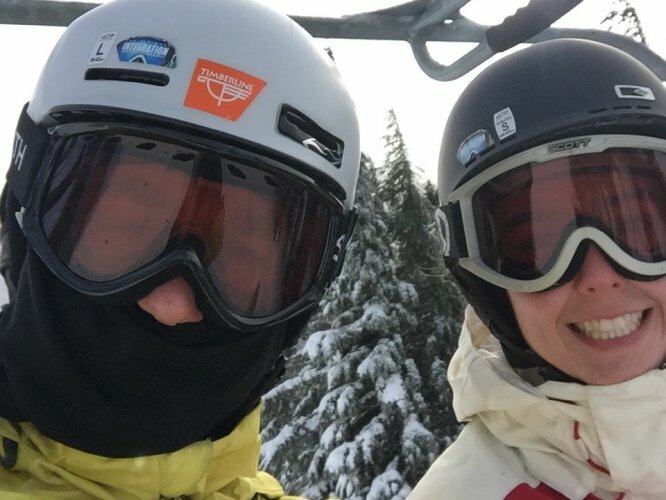 Growing up, my family was never a skiing family. I was raised by non-athletic parents on the East Coast and went skiing a total of about three times in my life. 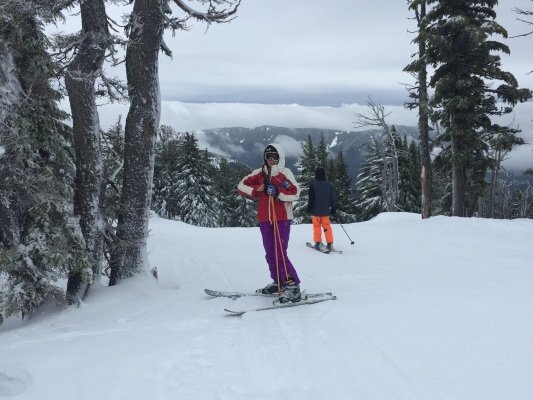 Mostly, I just hung onto the ski poles and did snow plow straight downhill trying desperately not to fall as other more experienced skiers zipped by me. Though I thoroughly enjoyed being outside in the snow, and zooming as fast as I could downhill, I always figured I could get the same enjoyment from simply sledding. Fast forward twenty plus years. I married into a family of skiers. 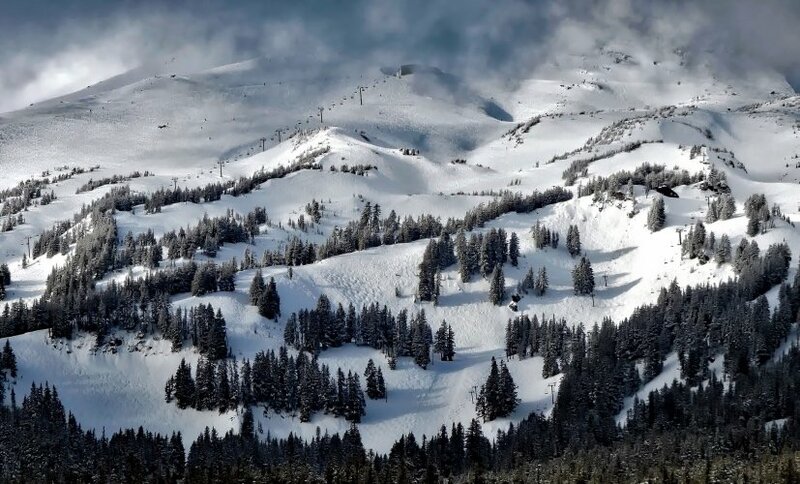 A few years back, we started getting together for annual ski trips at Mount Hood. My husband’s kin all had ski lessons as kids and went on family ski trips when they were growing up. They all skied with grace, were athletic, calm and really confident on the slopes. That first year, I tried my best to keep up, and, coupled with the fact that they were all patient and kind, I think it worked out pretty well. I was grateful though, when the trip was over and I had a year to recover before the next round! My Father-in-law, kind hearted soul that he is, saw my challenges and struggles that first year and offered to get me lessons the second year. I was THRILLED when they put me in with the beginner kids. That was just my speed! I had an amazing instructor who had been teaching for almost thirty years. She was patient and kind. She was an expert at watching what I did and feeding back to me the different ways I could experiment with the skis, the poles and my weight and balance. I was getting the hang of it! I was actually starting to have fun! I was smiling! Over the years, my martial arts training has helped me more ways than I can count. I have gained strength, endurance, balance and a certain small amount of grace. I have learned to stand up for myself, to respect myself and to live with integrity. And I have learned to roll! Back on the slopes, we faced a challenging hill. From my position at the top, I wondered how I’d ever make it down. I started gingerly at first, picking up speed as I felt more confident. Before I knew it, I was going faster than I’d ever gone before, loving the feel of the wind in my face and the swish of the skis through the snow. Just as suddenly, I felt myself starting to careen out of control. I was loosing balance, going really fast and heading straight toward some big trees. Big trees with hard trunks! Getting closer! Without thinking, I did a dive roll. I dove off those skis and tumbled through the snow doing two rolls downhill before I came to a stop in a pile of snow. I got up laughing, covered with more white fluff than an arctic polar bear. I collected my skis and poles and made my way down to my instructor, happy to have stayed so calm, acted so fast, and ready to keep going. When I got to her, she asked if I was OK. I said sure, it was actually kind of a hoot. She got very quiet and looked at me, tilting her head. Finally, she said, “I have been teaching skiing a long time and have never seen anyone do that. I was sure we’d be calling medical patrol. But you thought it was…fun? I really haven’t ever seen anything like that in all my days instructing.” I told her about my training, and then it was her turn to laugh. “No wonder”, she said, “now it all makes sense!” Later that day, when she was recounting the story to someone sitting next to us on the lift, she learned how old I was and was shocked. So yes, in the art of Poekoelan Tjimindie, I learn all sorts of things: to fight, to build my character, to work out hard, to help create peace in the world, to face my fears, to believe in myself and to live with compassion. And I learn to roll! I think everyone should train Poekoelan! Yes you too! After all, you never know when a good solid dive roll will come in handy! Even when you’re in your 50’s!